The Soviet Union's Sputnik 1 became the first artificial satellite on October 4, 1957. English-language dictionaries often define the word "sputnik" as the Russian term for a "fellow traveler," but the meaning of the word is much more specific. It refers to a person with whom one is traveling, perhaps by accident or coincidence, on a long voyage or journey. This was certainly an appropriate name, considering that satellites became and continue to be an important part of our everyday lives. The journey continues. Today, Earth orbits are filled with communications satellites, global-positioning satellites of differing flavors (the U.S., Russia, Europe and China all have their own constellations of such spacecraft), spy satellites (optical, electronic and others), and Earth-observation satellites (including weather satellites), just to name a few. Several companies are also working on global internet satellites, small constellations of Earth-mapping satellites and other small satellites. As technology improvements enable smaller and lighter satellites, expect the number of spacecraft and applications to grow significantly. This can be a problem. Orbital debris is considered the most likely and most dangerous threat to active spacecraft. Old satellites in geostationary orbit use the last bits of their fuel to go to a "graveyard orbit" high above the operational altitudes of other such satellites. However, most of the newer, smaller satellites will be launched to low Earth orbit (LEO), where the International Space Station and other crewed vehicles operate. Regulations and agreements will be needed to ensure that these satellites will be deorbited safely to burn up in the atmosphere when they are finished with their missions. But, furthering the problem, these small satellites are difficult, and in some cases not yet possible, to track. We will have to figure that out. 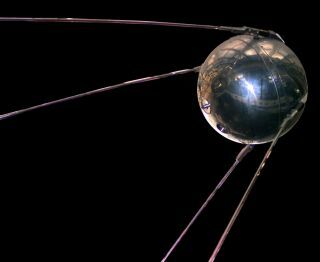 Sputnik 1 paved the way not only for other satellites, but also for human spaceflight. Just a few years after Sputnik 1 left Earth, Yuri Gagarin was launched into orbit, proving that humans could live and work in space. Eight years later, Apollo 11 landed astronauts on the moon. To quote the tagline from "The Right Stuff," one of my favorite films, "This is how the future began."